I feel truly honored to be here sharing Robert Kaufman’s celebration of 30 years of Kona Solids! Now this wonderful collection has 303 different colors! To celebrate, they asked 30 different designers to play in their crayon box and come up with their favorite quilt in Kona Solids. (Good thing they like the number three!) And guess, what? They asked me to be one of them!! YES! 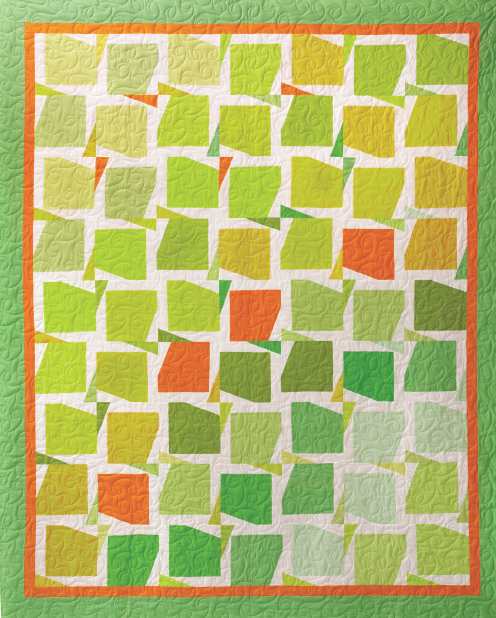 I was in a particularly springy mood at the time and completely inspired by their yellow, lime, and orange colors… So, allow me to present Spin City in citrus colors! 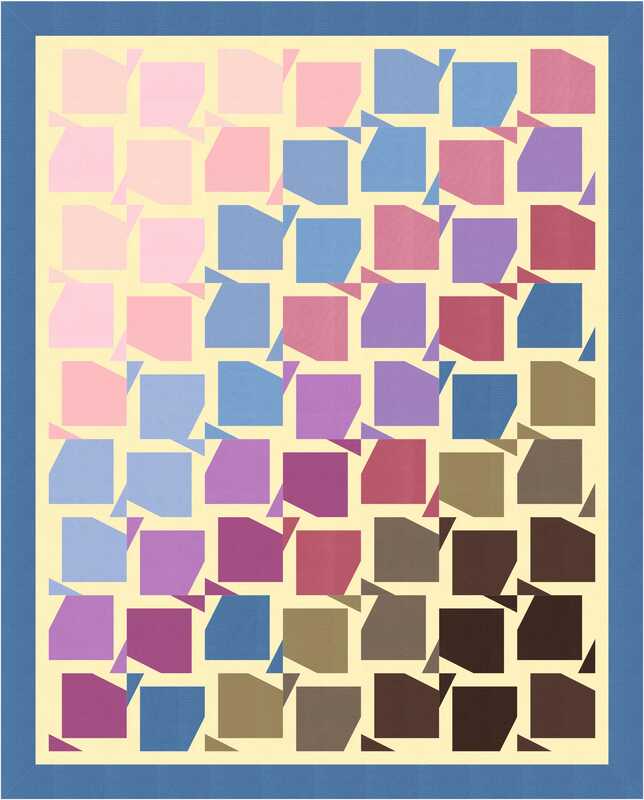 I picked a quilt that is 10″ square friendly so I could play with the many different shades and really show off the collection of Kona colors. 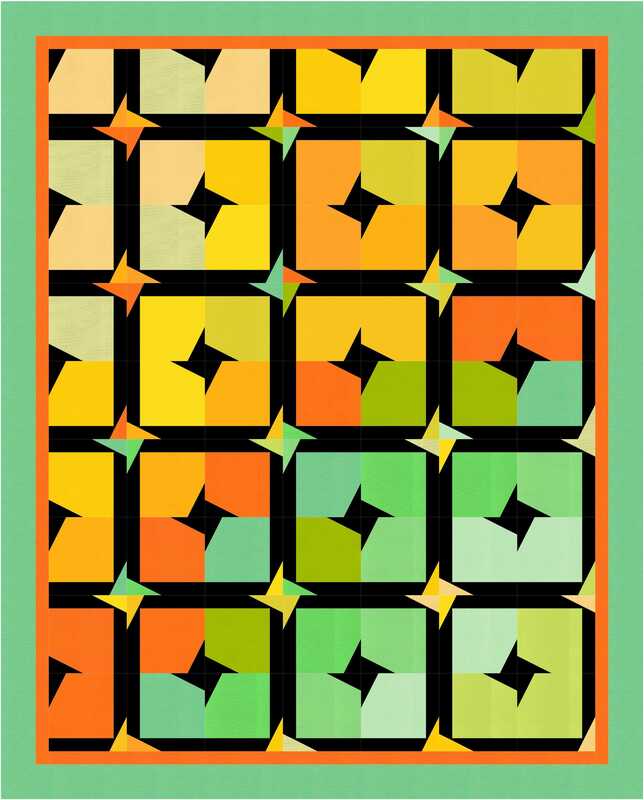 I also picked one of my favorite Cozy Quilt Designs patterns for showcasing lights, mediums and darks. At first I played with it in Electric Quilt, so I actually had a few other options to consider… check out this graphically engineered version in soft blues, purples and browns. Don’t you just love the shading effect? Or how about this version that uses black as a background? I twisted and turned the blocks to create a totally different look! My very favorite thing about designing is exploring all the many options quilting can offer.. even within the same pattern! We are on day five of a month-long blog hop. Visit them all and qualify for prizes all along the way! And on a finishing note. If you don’t know me yet, my name is Daniela Stout, and I invite you to join me in my Cozy world! I own Cozy Quilt Designs (a book and pattern company) and Cozy Quilt Shop located in El Cajon, outside San Diego. We are about to move into a larger location and change our name to Cozy Creative Center… so big things are happening for us.) Come to our website and visit for a bit. Subscribe to our newsletter for local events and online savings. If you subscribe, we’ll even give you a free pattern!